With the increase in lifestyle-related diseases like diabetes and hypertension the prevalence of Chronic Kidney Disease (CKD) is increasing exponentially and with it is increasing the burden of its ominous consequence, End Stage Renal Disease (ESRD). While ESRD is no longer a death sentence with the advent of efficient renal replacement therapies and the success of renal transplantation, factors such as high cost of these procedures, limited availability of donated kidneys and not enough number of centers equipped with these facilities puts the effective management of ESRD beyond the reach of an average person many-a-times. Additionally the presence of co-existing diseases that contribute to and sometimes complicate the renal impairment as well as delayed referral of the patients to nephrologists also makes matters worse. ESRD is not just a medical but also a social and economic condition that devastates the person and his/her entire family. Hence, early detection and effective prevention of progression of CKD in early stages to advanced CKD and ESRD is the call of the day. In fact, understanding the pathophysiology of the condition and adopting methods of primordial prevention in populations at risk may be desirable to ensure reduction in the incidence of CKD. In those with established CKD, a proactive approach to manage the disease manifestations and limit the ravages of other comorbidities is desirable. For those in advanced stages of CKD, the institution of an appropriate renal replacement therapy individually suited to the patient keeping in view the medical status, lifestyle requirements, economic viability and social acceptability should be advised. 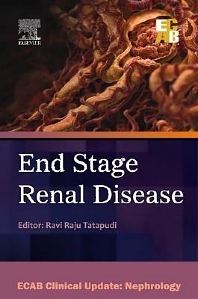 This book will help the reader understand the intricacies of the aspects mentioned above and guide the practitioner to diagnose and manage End Stage Renal Disease with special reference to practical experience of the same in India. The authors have put together the most relevant facts about the disease for an easy comprehension and understanding of the same by practitioners and students across the specialty. Director of Medical Education, Government of Andhra Pradesh, Hyderabad.